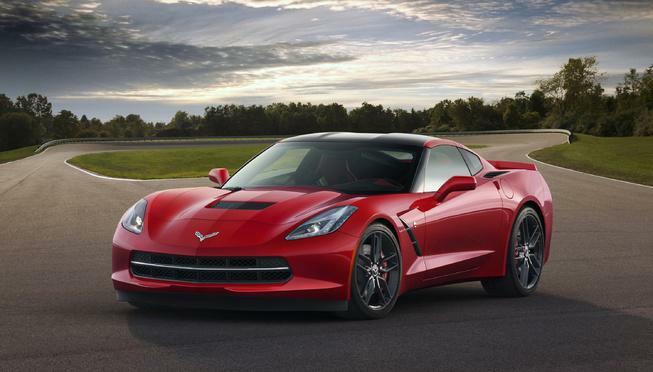 Chevrolet has announced the official power output for the 2014 Corvette Stingray’s 6.2-liter V8. With 460 horsepower and 465 pound-feet of torque, Chevy says the Stingray is the most powerful standard Corvette ever. Those numbers come with an asterisk though: they only apply to cars with the optional performance exhaust system. The standard system subtracts five horses and five pound-feet, for 455 hp and 460 lb-ft. Still, what’s five horsepower between friends? Whatever exhaust system the Stingray is running, the figures match Chevy’s original estimates. Since the 2014 Corvette was unveiled at the Detroit Auto Show back in January, Chevy has been calling it the most powerful standard ‘Vette ever; these output figures just confirm that. The final numbers are slightly more optimistic than the estimates Chevy gave in Detroit, whether the Bow Tie Brigade said the 6.2-liter LT1 V8 would produce 450 hp and 450 pound-feet. Either way, the Stingray is more powerful than a base 2013 Corvette coupe, which is only good for 430 hp and 424 lb-ft, and its eternal rival, the Porsche 911, which makes 350 hp and 287 lb-ft in base Carrera form. All of those ponies should accelerate the Stingray to 60 mph in less than four seconds. Chevy hasn’t disclosed its top speed. The redesigned Corvette engine is also more fuel efficient than last year. Chevy expects it to get more than 26 mpg, thanks to fuel-saving technologies like direct injection and Active Fuel Management, which shuts off four cylinders under light loads. The 2014 Corvette Stingray coupe goes on sale this fall, with a convertible following it just in time for winter. Prices start at $51,995 for the coupe and $56,995 for the convertible.